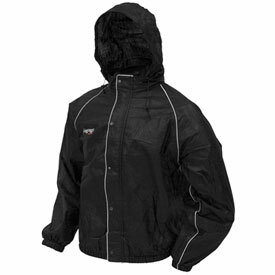 Bomber style jacket design with classic waterproof, breathable Frogg Toggs, non-woven polypropylene material. Frogg Eyzz reflective piping provides better visibility at night. Features a raglan design action-cut sleeve which offers larger arm openings for easy on and off and more mobility. Sleeve design eliminates seams on shoulders and other stress points. Tuck-away hood designed to be worn under hat or helmet. 1 in. wrist bands designed to keep rain out. Storm flap with nickel-plated spring snaps that will not rust. Full cut design for active use and designed to be worn over insulated clothing. False cape design offers increased rain protection while preventing ballooning of garment that often occurs when traveling at high speeds. Bought these for an adventure ride to Alaska and back, glad I had them as it worked well in the rain and for layering in the COLD mornings. The only rub was within the first few minutes of wearing I lost the first inner or male snap, by the time our trip was over I lost all of the inner portion with the exception of one snap. Jacket still performed as advertised except for this problem. Can frog Togg suits be used on an ATV in wet and muddy conditions. If so, how do you get it clean?